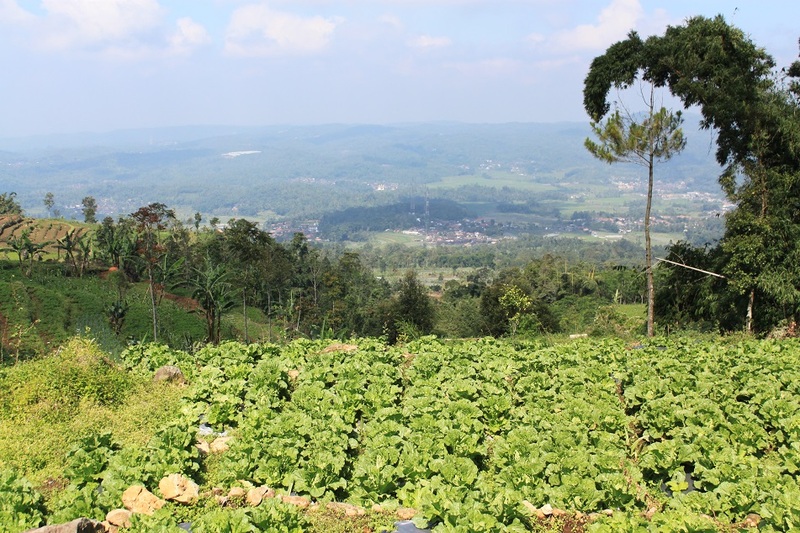 Gedong Songo: Prelude to Borobudur | What an Amazing World! 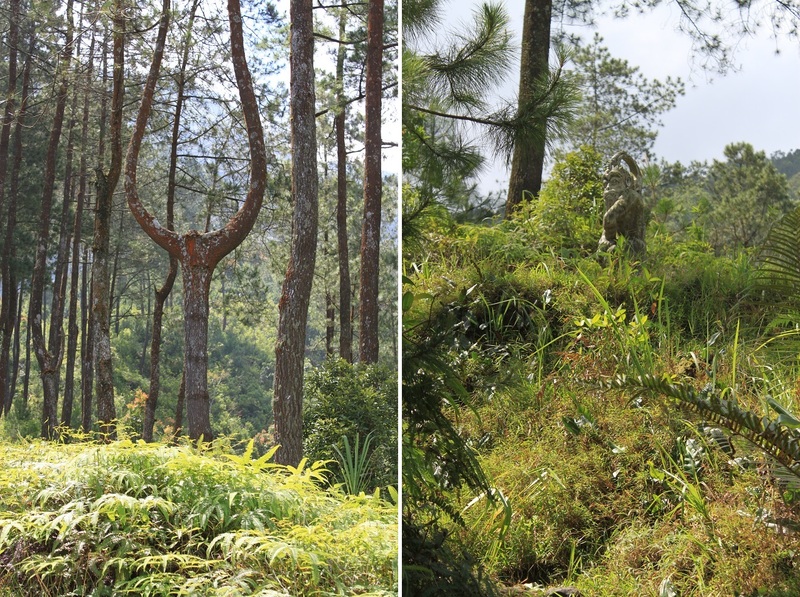 On the slopes of Mount Ungaran in the temperate climate of Java’s hilly terrain, perches several small ancient temples amid rose gardens, cabbage fields, and wild taro and coffee trees. The sky is clear, the sun shines brightly. This place is only less than 40 km away from where I was born. 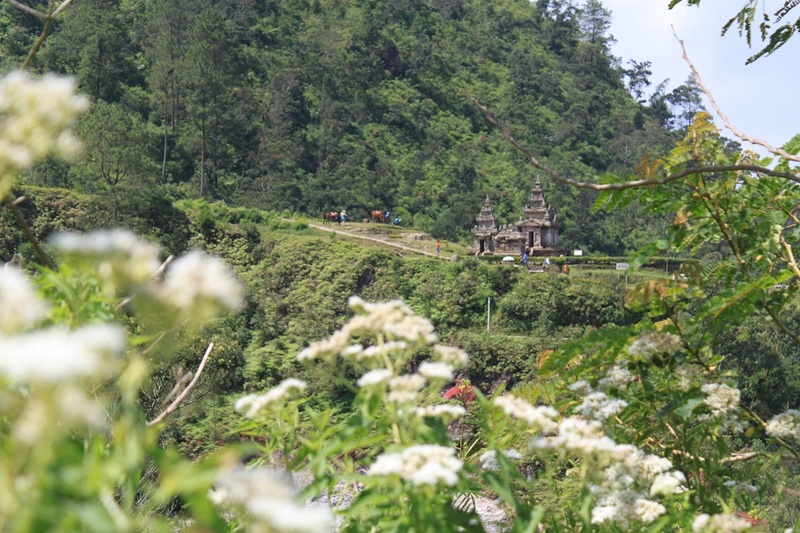 But it has taken me 28 years to finally set foot in Gedong Songo – Javanese for ‘nine buildings’ – a temple compound in this cool refuge from the unbearable heat and humidity of Semarang, the capital of Central Java. Originally studded with nine Hindu temples, hence the name, today only five remain largely intact and excavated. The rest are now merely in ruins. 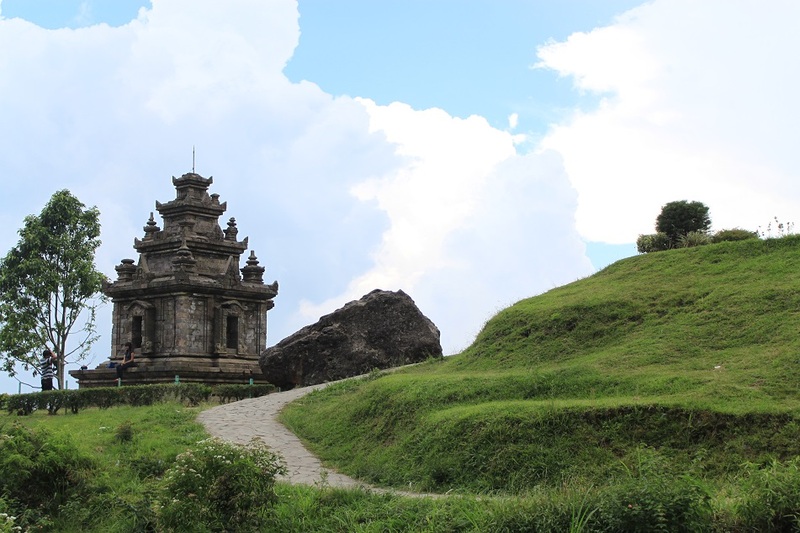 Built in the 8th century out of volcanic stone, the temples are fine examples of the Early Classic style of Javanese architecture. 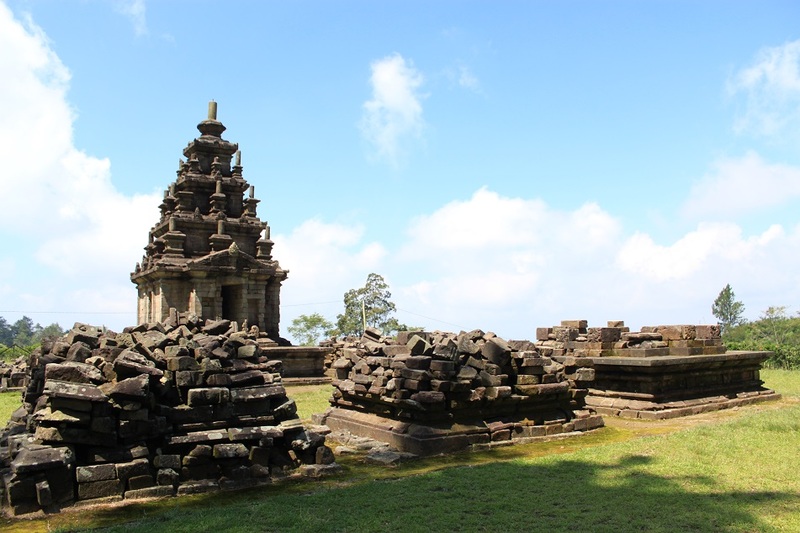 As one of the oldest temples in the island of Java, Gedong Songo pioneered the way for the construction of even more magnificent Javanese temples of Borobudur and Prambanan. The former even inspired King Suryavarman II of the Khmer Kingdom (present-day Cambodia) to build an even larger religious monument, Angkor Wat. Instead of taking the normal counter-clockwise route from Gedong I to V, Alexander and I opt for the opposite. Snaking uphill on a path under the scorching heat takes its toll. I have to stop every now and again to catch my breath, thanks to the succulent and sumptuous dishes I had the previous day. Occasionally horse-riding visitors pass us by, seemingly indifferent of the calorie-burner path. 10 minutes after we start the hike, we come to an ascending path where the mighty Mount Ungaran stands before our eyes. It is literally like climbing the stairs to heaven. Not long afterwards, we see the first temple – although technically the last temple in a normal circuit. Dotted with boy and girl scouts seeking a refuge from the sun, Gedong V is located at the highest elevation of all the five temples, standing graciously against the ravine which separates the two main sides of the hills. Gedong III and IV are clearly visible from this vantage point, each perched on a slope of the verdant backdrop. 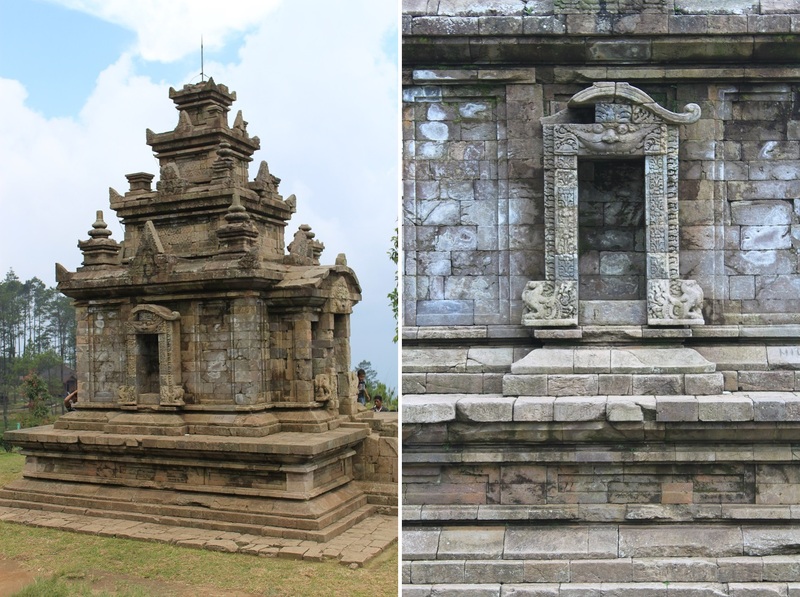 As the predecessor of the great Javanese temples, Gedong Songo’s decorative elements are quite modest compared to its bigger sisters. However the projecting vestibule and “false linggam” spires on top of its temples are some of the most distinctive features of the structures from the Early Classic period. Each temple has its own distinguishing feature. 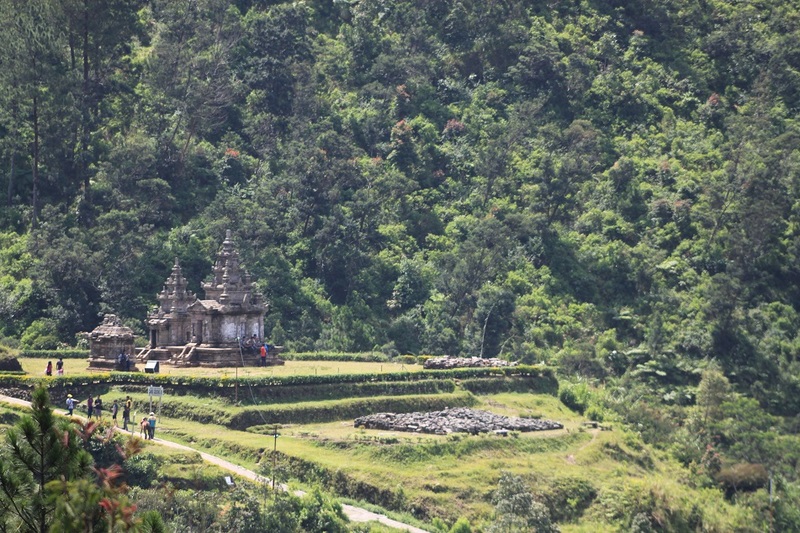 Gedong I is a lonesome structure compared to the rest of the compound; Gedong II has its kala-makara relief; and Gedong III which consists of several temples depicting Shivaite Hinduism. Wandering further through the scenic pathway, we notice white clouds hanging over a small temple just north of Gedong IV. Coming closer I realize that it is not a cloud, but rather a gas with a putrid scent. Puffing gently from above the hill, the true power of the fumarole can only be comprehended by walking down the twisting path leading to the earth’s showcase of power. Right next to the small crack where the sulphurous gas escapes to the atmosphere, lichens cover the volcanic stones, flourishing despite the heat a few meters away. It is probably the same energy that brought people to this rugged terrain and erect these venerated temples. 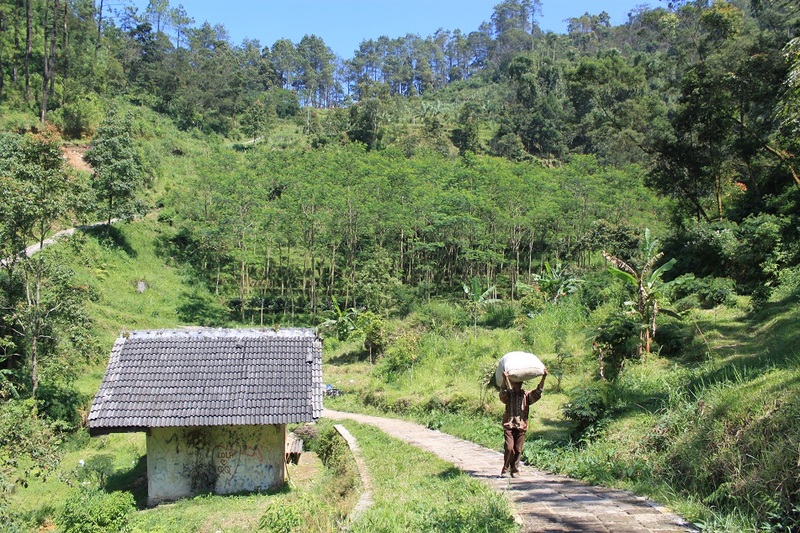 Because this is Java, the land where mysticism is the norm amid the shadows of its towering volcanoes. From what I’ve seen, it looks like Gedong III is the most photographed of the nine temples. You went on a beautiful day – they seem so secluded and well off the tourist trail. 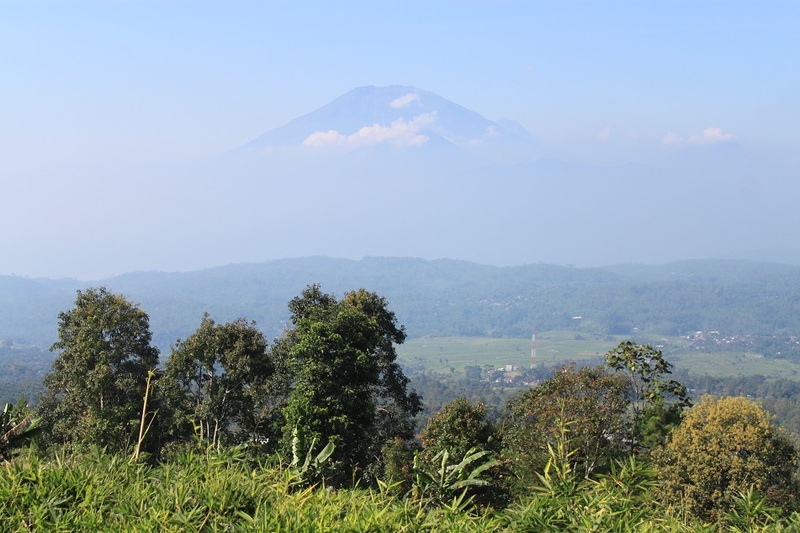 I especially love the shots of Merbabu and Sindoro rising out of the haze – it must be perfect for watching the sunrise or sunset. Thanks for sharing, Bama! Yes, it is. 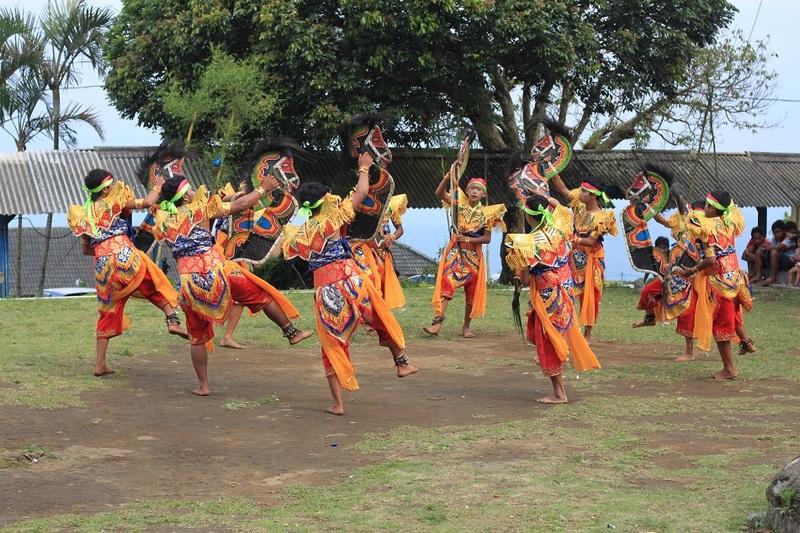 It’s also often featured in various TV commercials, including the Dutch version of Garuda’s TV ad. 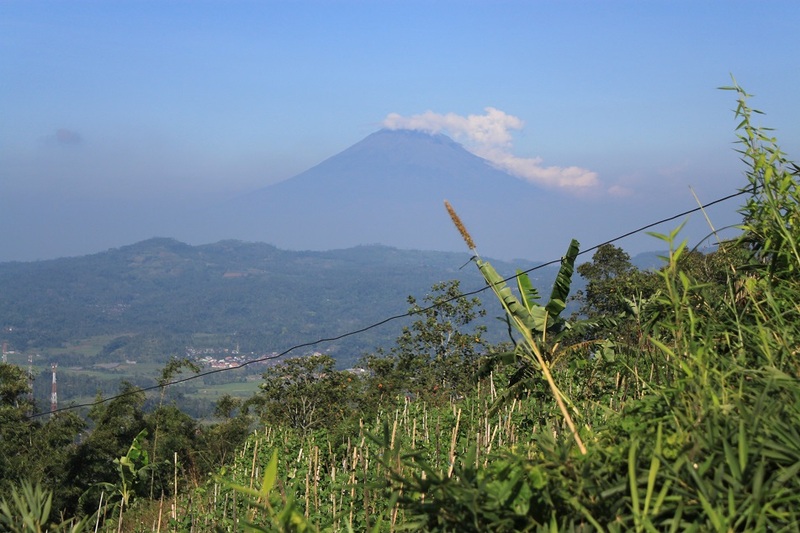 I know you would love those shots of Merbabu and Sindoro. After all, you’ve always been attracted to volcanoes. 🙂 It was indeed a nice sunny day, but I was too ignorant to put some sunscreen prior to exploring the temples. Hence the sunburns. There are so many beautiful places in Indonesia. The history of it also have its own greatness. Hi Bama, I thoroughly enjoyed this post. I have not heard about the Gedong Temples. What a treasure. The temples look exquisite but most of all, the location is so bucolic, so spectacular and looks so tranquil. 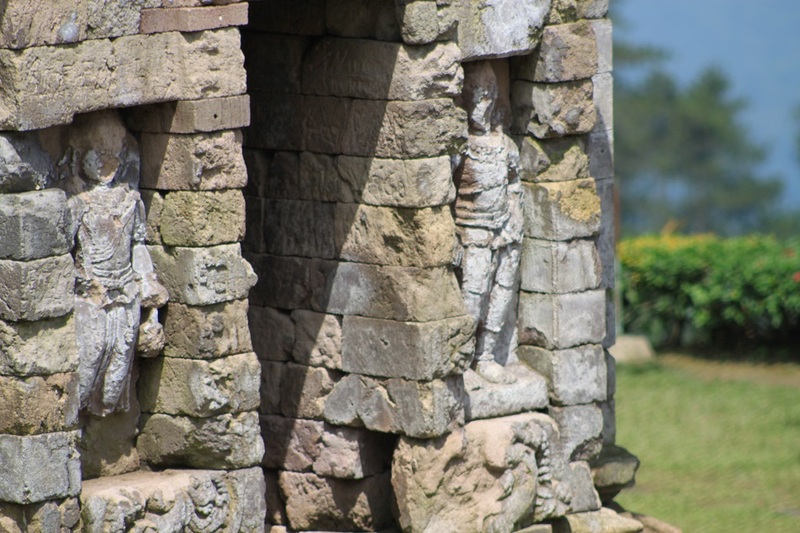 The ancient Javanese knew how to pick the location for their temples well. Thanks for the introduction to Gedong. Hope to get there one day. As always, you managed to present a beautiful pictures as well as the story about it. 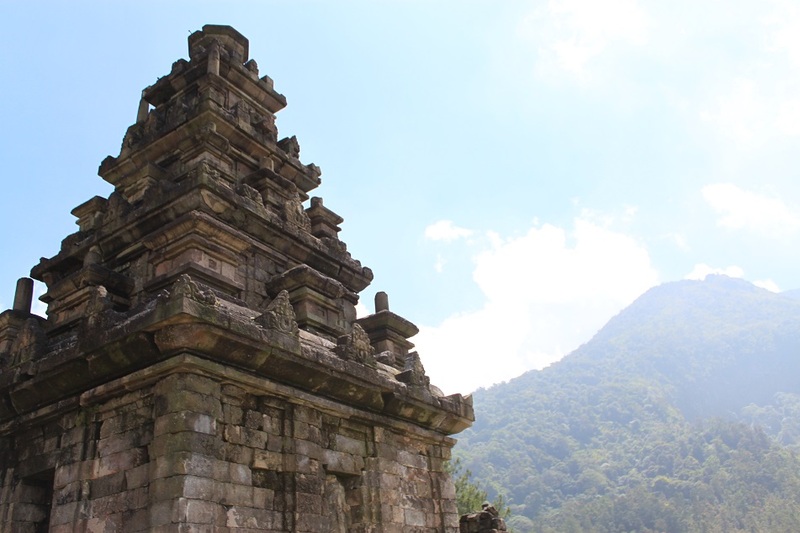 I think I’ll go to visit gedong songo someday. Thanks for sharing! Thank you for your encouragement! I myself need to explore more places in Central Java though, because there are much more than just Borobudur and Prambanan. A reblogué ceci sur invitango. This is my hometown, when I was 5 years old my parents took me to this place for the first time. Hi Eva! I always call Semarang my hometown as well, even though I never really live there. My parents live in Semarang now so I visit the city regularly. Looks gorgeous and definitely worth the visit! It was indeed worth a visit and a nice getaway from the heat of Semarang. What a stunningly beautiful place Bama! Love the long shots across the ravine. Haven’t seen or heard of a lingam spire quite like that anywhere in India! Wonder if that ‘peculiar thing’ is a trident (Shiva’s weapon) with one prong missing? It surprisingly was Madhu! Speaking of the temples in India, I really want to go to Airavatesvara Temple because of its intricate wheel ornaments. I never see such ornament in any other temple, or I could be wrong. 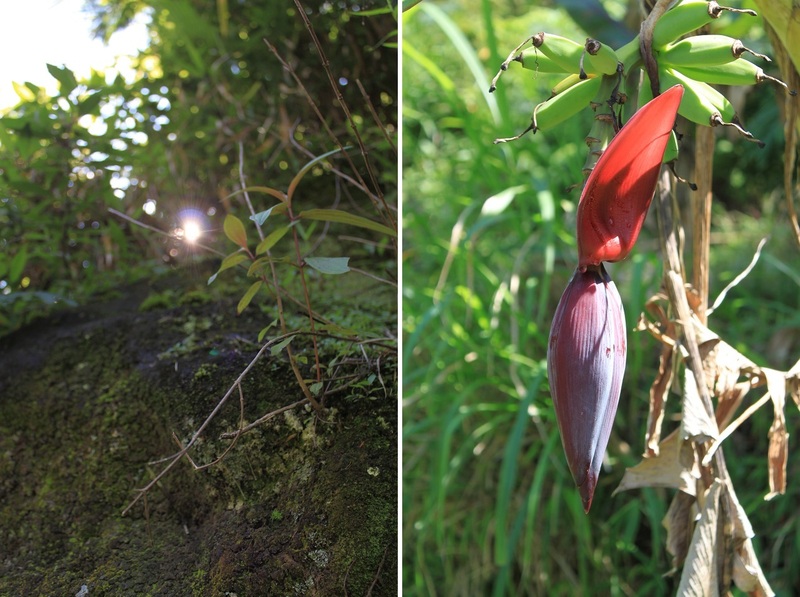 That peculiar thing is actually a living breathing tree. It’s the only one which looked like that. Even though this place is not a usual spot for people to meditate, but it actually could be. I always enchanted by the choice of the words in your description, unusual. How if you do retouch your pictures, (reduce the brightness and adjust the contrast). I’ve ever seen the photo by Yoppie Pieter of Gedong III (across the ravine as yours) with early morning sun shine just fall on it gently, too beauty. I am afraid that is not right and too simply. In the main courtyard of the magnificent Candi Lara Jonggrang in Prambanan, consist of Candi Shiva in the middle, Candi Brahma (right of Candi Shiva if we stand in the Candi Shiva looking outside, or South of) and Candi Wisnu (left of Candi Shiva, or North of). Apparently,Three perwara temples facing three main temples. In front of Candi Shiva is Candi Nandi because there is Nandi statue inside (as the vehicle of Shiva) flanked by Surya and Candra. 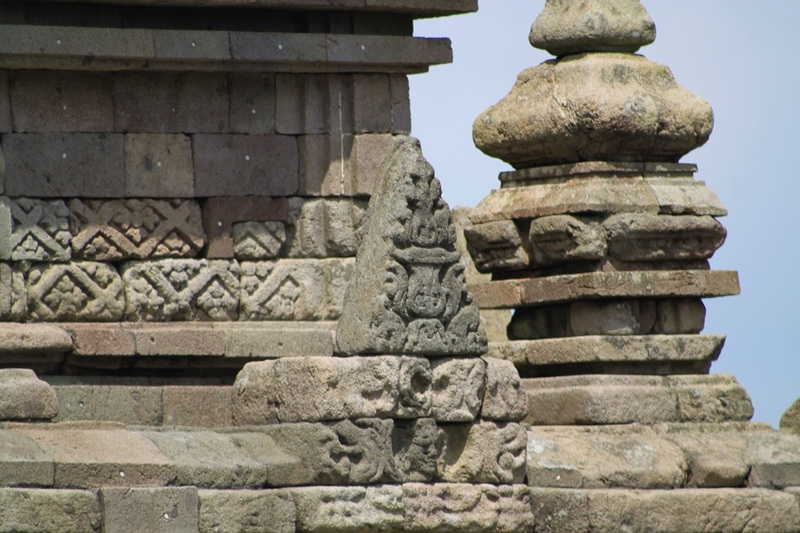 Left and Right of Candi Nandi, it cannot be simplified as Candi to house the vehicle of Brahma (Hamsa) and Vishnu (Garuda) since there is no evidence statue of it or any identified (Now archaeologist called it as Candi A and Candi B). Hindhu Java has a unique architecture and layout in religious buildings (not copy paste the India style). 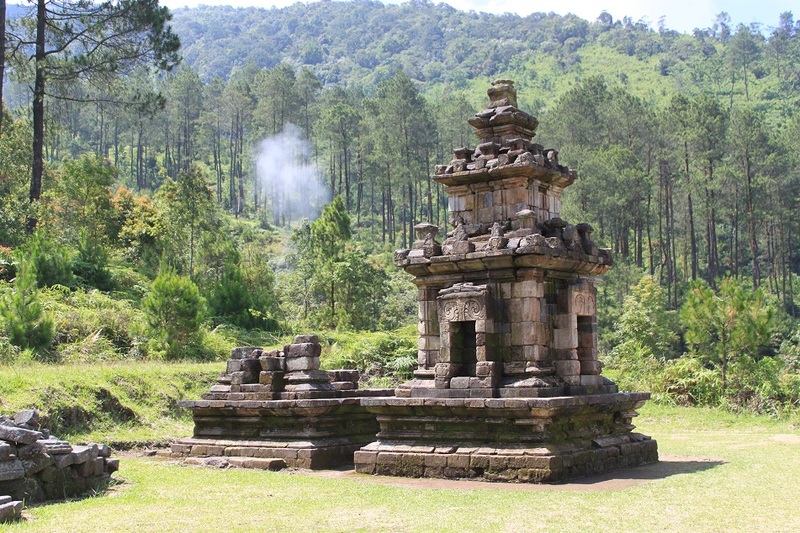 (We can compare with Candi Ijo, Candi Ngempon near Semarang and Candi Arjuna in Dieng or Candi Kimpulan in UII Jogjakarta which all never the same in layout and symbolism). 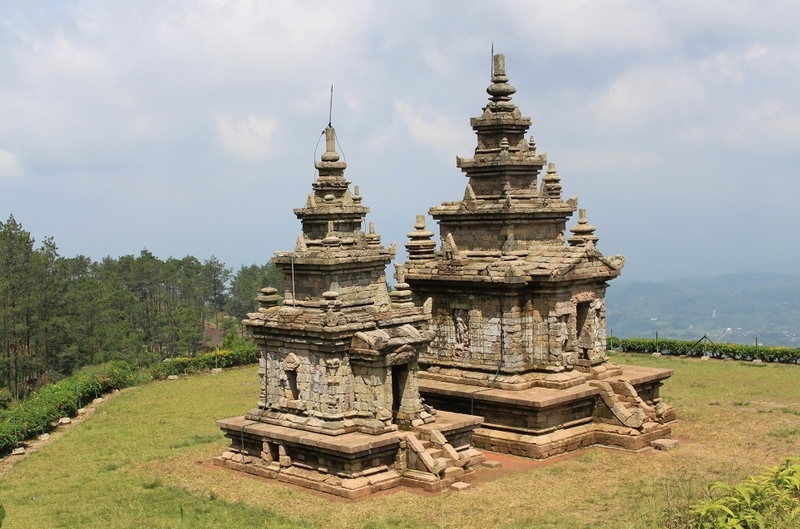 Though, the explanation of Candi Gedong IV will be quite challenging, since the main temple (not obvious in your picture) has two perwaras on the right and two pervaras on the left, one pervara on the back, and three pervaras facing the main temple. 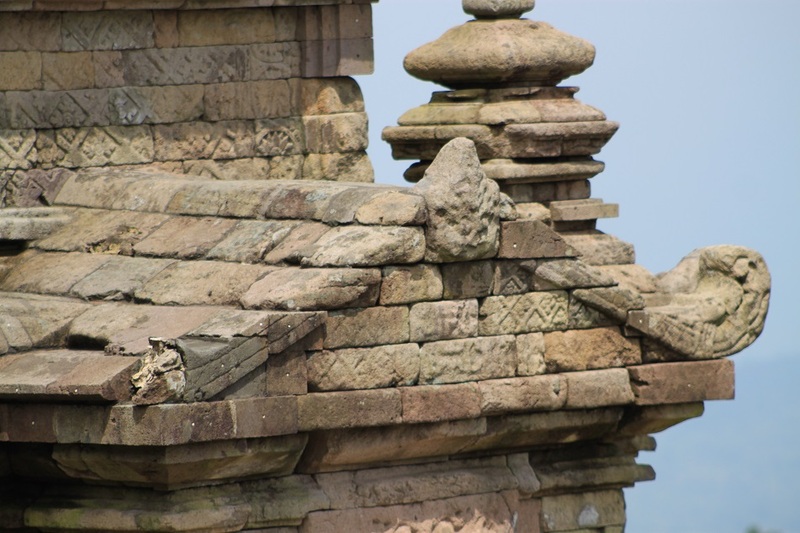 And the twin temple as in your picture with White Sulphurous Clouds is also part of Candi Gedong IV complex. The unique is Candi Gedong I (why no picture? 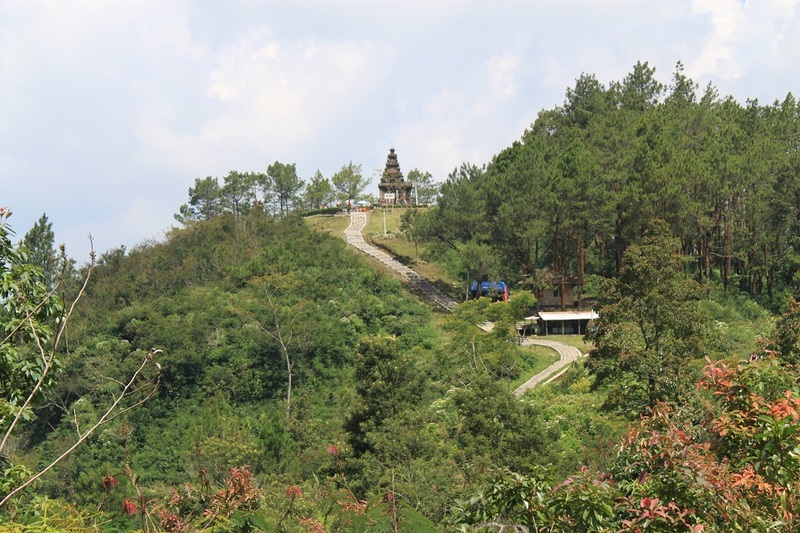 ), which has no niche and has platform with low parapet (only small part remains) which the only one in Gedong Songo complex and suspected as Buddhist temple because of it. Thanks for your very detailed comment Sapto. 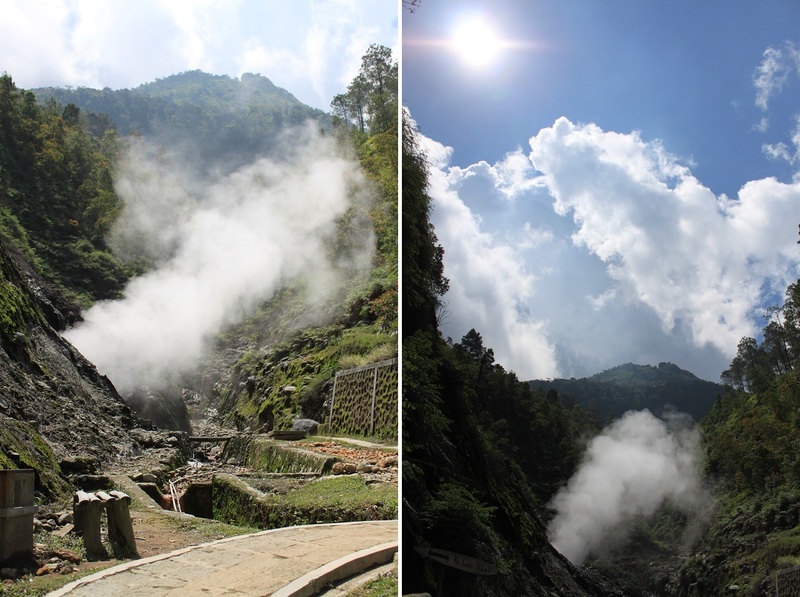 I really appreciate it, and I have made a minor correction on the description of Gedong III as you suggested. This must have been a real neat journey where there is a lot of climbing mountains or hills. Does anyone ever take care of the place other than tourist guides going by with tourists at all? It was indeed, Rodney. But when I did the trip I was significantly fatter, so I was not in my best shape at all. Actually this place is quite well-managed and there are staff to take care of the temples and its surroundings.